Tolle Legge. Because books matter. When you sell a person a book you don’t sell him just twelve ounces of paper and ink and glue—you sell him a whole new life. Love and friendship and humor and ships at sea by night—there’s all heaven and earth in a book, a real book, I mean. …I myself was getting wild. I wanted wildness, originality, genius, rapture, hope. I wanted strength, not tea parties. What I sought in books was a world whose surfaces, whose people and events and days lived, actually matched the exaltation of the interior life. Those of us who read carried a secret around with us like martyrs a secret knowledge, a secret joy, a secret hope: There is a life worth living where history is still taking place; there are ideas worth dying for, and circumstances where courage is still prized. This life could be found and joined, like the Resistance. I kept this exhilarating faith alive in myself, concealed under my uniform shirt like an oblate’s ribbon; I would not be parted from it. The thoughtful reader surrounds himself with inducements to substance. I don’t know how Dallas Baptist University has done it (well, I have an idea and it has to do with the extraordinary professor there, Dr. David Naugle) but they nurture some of the most remarkable students and alums I have met. I mentioned in my last post that I had been invited to address the annual Paideia Society and Honor’s College conference there, speaking on the role of reading in the life of the believer, and the future of the book in our increasingly fast-paced/digital/virtual culture. I had the great privilege of taking my place behind previous speakers from other years, speakers and authors as prestigious in the thoughtful evangelical world as Nigel Cameron, Os Guinness, Steve Garber, James K.A. Smith. They’ve had Polanyi scholar Esther Meeks and Mars Hill Audio founder Ken Myers and Citizens for Public Justice Director Gideon Strauss and Grammy-winner, music producer (and founder of ArtHouse) Charlie Peacock. In a week or so, the college will host poet Luci Shaw. I really was nervous speaking from the same podium as had eminent scholars such as historian George Marsden and world-class philosopher Alvin Plantinga. Doc Naugle, mentor of philosophy students and friend of nearly everybody, hosted me well, and the students and alum of Paideia and of the Honors College (under the leadership of Dr. Philip Mitchell ) were very impressive. Since this was party an academic conference, serious papers were delivered on all sorts of obscure scholarly topics. And they were excellent including some done by undergrads. I took in papers comparing the way Aristotle is used in N.T. Wright’s book on character (After You Believe) and Naugle’s own Reordered Love, Reordered Lives and another on the role of fairy stores, and yet another on strategies for guidance counselors for responding to youth violence. I learned much about Augustine’s view of reading in one, and picked up the copy of one comparing Tolstoy and St. Luke. There were papers on Dylan, another comparing Springsteen and Flannery O’Connor, and a few whose topics I didn’t even understand. It was especially gratifying for me to see how God has been faithful in raising up young scholars—a few of the presenters are themselves now professors at other schools in Texas, mentoring undergrads in the way that Naugle and others at DBU so shaped them. To see how the vision for distinctively Christian scholarship can take hold and unfold as young scholars stay faithful to Christ in the academy is very exciting. Talk about taking your faith into the work-world to be agents of influence in a difficult career area! Our Hearts & Minds friends sometimes like to follow our work, so rather than announcing new books we’ve received here at the shop, I’ll share just a bit about my time in Texas and hold up some related books for your consideration. I’ve been pondering this reading stuff for years, you know, so was delighted to have such a friendly crowd to whom I could preach. I do think I was pretty much preaching to the choir, but I carried on nonetheless. I thank them for their patience and good humor. And the tacos. The title of the event was tolle lege, which, you should know, is the Latin phrase (perhaps a playground rhyme or jump-rope chant) that the hung-over Augustine heard in his garden one bright day. He did, indeed, “pick up and read” and was famously converted after his eyes fell on the first book he found (a Bible.) Dr. Naugle had buttons printed up with the line–“tolle lege: take up and read” as a reminder of the importance of not only knowing Augustine but of, as folksinger Kate Campbell drawled in an evening concert, “Just pick it on up and read the thing, yall.” Right on, sister. I often start my talks on this topic with an episode in a Chaim Potok novel where a Jewish boy and a Catholic kid watch a Hasidic ceremony where exuberant men dance with the Scriptures. “Don’t you dance with your book?” the Jewish boy asks his friend. Do we dance with our Scriptures, our words, our books? It is a good question. I am afraid a few of us still do, but we are becoming a real minority. 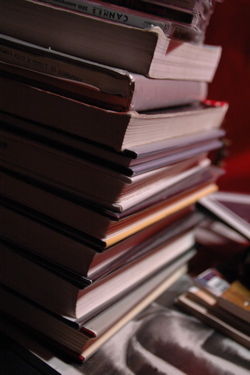 Allow me to refer you to a piece I wrote for Comment magazine a few years ago called “Learning to Love Good Books.” I wanted it said, if only in passing, that I do not quite buy the presupposition that there is a huge dichtomy and battle between the word and the image, between books and screens. I had this passed out on Friday at the DBU event, too, because I did not want my passion for the printed page to lead us to needlessly dis God’s good gift of image, screen, and internet. Films and TV shows and video games are all valid and good things; they are different than books, and are at times needlessly played off against one another (as Postman does.) To affirm the roles of music and movies is important. We do not need to affirm the importance of reading by demeaning the fine arts of images, moving or otherwise. And certainly many of our most loyal book lovers, those who understand the tactile and aesthetic dimension of reading, do travel with a e-reading device. As usual, things aren’t quite either/or, are they? their academic papers and speeches and heady intellectual discussion. I was nearly jumping out of my seat with joy anticipating the show put on by an occasional band called The New Agraians (their name a hat tip to the mid-twentieth century writing tradition of Southern populist literature.) I love all three of these folks as solo recording artists and hearing them do songs about the southland—capturing a sense of place and localism and specificity that is important for good writing—was an incredible treat. Check out Pierce Pettis, Kate Campbell, and Tom Kimmel, who do some of the finest singer-songwriter stuff I’ve heard. There are some youtube clips of a bit of the show and you could check those out. And start praying for them so they can get a New Agraians recording thing in the works! Still, there is something slow and interior and formative about books, at least books that are taken seriously. Unlike pixels where blocks of text can be eliminated in a moment, with the tap of keypad, where content has an “unbearable lightness of being” giving it the air of the ephemeral, there is something more weighty about a book in the hand. Can blogs and reading on iphones carry the necessary gravitas that paper and ink can? Can we take reading and learning seriously in our distracted age? What are the implications of 2 Timothy 4:13 for our own lives these days? These are huge questions that I meandered through, and I invite you to think about them too. For what it is worth, in three presentations I suggested that we should, indeed, “pick up and read.” Books matter, and I gave (at least) three reasons. Firstly, books matter because people matter. Books have changed lives in large and small ways for centuries and if we love our neighbors we will want them to have experiences that can be transforming. Great ideas and stories and teaching come packaged in books and it is our Christian duty to share them—hoping for the sorts of changes that we’ve seen down through redemptive history. I shared about a dozen episodes of how somebody loved somebody else by sharing books and reading. I told of Saint Patrick’s ancient language work with the Celts and John Newton’s conversion by reading The Imitation of Christ and his influence on Wesley–whose carriage was fitted with bookshelves!—and William Wilberforce to the spiritual renewal God gave Abraham Kuyper when a wise laywoman gave the liberal pastor The Heir of Radcliffe, a novel that changed his soul. We know of the thoughtful conversations about the essence of story between Roman Catholic J.R.R. Tolkein and the atheist C.S. Lewis (and how his imagination was baptized by reading fairy tales by George MacDonald and how he found his way to Christ finally by studying The Everlasting Man by G. K. Chesterton.) We know Watergate bad guy bawled as he finished Lewis’ Mere Christianity, finding Christ on his way to prison and how he later learned to think more structurally about prison reform and cultural renewal after reading Kuyper. I told a few stories of the not-so-famous whose encounters with books made a difference in their lives. Can new technologies do that sort of things, transform lives? Can we share books, pass on the wisdom of authors, invite people to read with us, to join a reading club, can we do the sort of bookish ministry that has changed others if we all read on line? If we lose real texts and download whatever amazon has for your kindle? I don’t know, but books matter because people matter and our human-scale, communal use of books is a pattern and habit we must encourage. Secondly, I explained some different sorts of reading, appropriate for different sorts of texts. I held up the little article that I wrote at TheHighCallings blog called “Style Matters” which celebrated not just the content of books, but their style, their art, their passion. Content and style combine in the best authors and wise readers will allow themselves to be taken in by the experience. Not only do different books, though, take different approaches, we need some different sorts of motivations for reading—to remind us, but also to share with others, to encourage and give a plea for others to see reading as a Christian duty. I love doing presentations on this sort of thing and described reading as an act of worship, reading as an act of discipleship, reading as an act of spiritual formation, and reading as an act of contextualized mission. 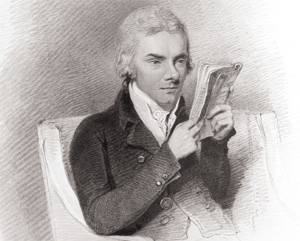 How can we learn to read worshipfully? To acquire content, as life-long learners? To have that information form us, to read deeply and, as Peterson’s book puts it, to “eat this book”? And, in our post-modern culture, how can we read missionally, learning about our world, engaging the important books and authors and themes of the world? In my third presentation I told some sad stories about those who do not seem to read much, whose faith appears shallow and lacks integration or coherence–significant folks in key occupations who have little desire to think and live as disciples in their given callings. How damaging to our Christian witness it can be when leaders teach such foolish things and act without regard for occupational integrity. How do we connect Sunday and Monday, and what principles and practices might facilitate a more robust community of discourse? How has dualism crippled our Christian witness, especially in the public square? Why do we seem to not be terribly aware of the implications of, say, Romans 12:1-2? That is, what can we do to help people live lives of whole-life discipleship, thinking Christianly, taking up our vocations to be agents of God’s reign in the world? ormation. Do you have bookish mentors, guides, reliable sources? I sure hope your bookish mentor isn’t a faceless order-filler at some on-line place that cares little for your soul or God’s work in your life. This is too important, I suggested, to not have bookish relationships with people you trust. I think we need small groups, intentional community, friends and mentors, colleagues who do life together, even in their thinking and studies (not unlike Wesley’s culture-changing bands with their method of reading classics, or not unlike Wilberforce’s Clapham group, friends for life who took up the cause of social reform together.) Such groups should read together, and encourage each other in developing a way of life guided by the best principles and practices. If we believe that books matter one of the reasons will surely be that ideas matter. Ideas grow legs and some take traction, making a difference in the world, for good or ill. Readers become leaders and with the right sort of vision and institutional support, our books will shape us in ways that may allow us to be faithful in small and big things. Perhaps we will, truly, make history. Who doesn’t want that in our time? May God be pleased as we do good works for the common good, inspired, perhaps, by good habits of reading good books. So, as I was spending time with folks in Texas I thought of books to share, some following up the list from the last post (The Shallows: What the Internet Is Doing to our Brians, The Gutenberg Elegies: The Fate of Reading in an Electronic Age and so forth) and some others only somewhat related. Here are some more or less random suggestions to carry us further into this important topic. In no particular order. Enjoy. God and Gadgets: Following Jesus in a Technological Age Brad Kellenberg (Cascade) $22.00 This author has been an engineer, a theology prof, and has written a wonderful book on postmodern evangelism. This new work raises the huge question about our relationship to our stuff, especially the technological sorts of stuff of our hot-wired age. He’s a bit of a Wittgenstein scholar, too, but don’t let that scare you aware. Very provocative and very important. 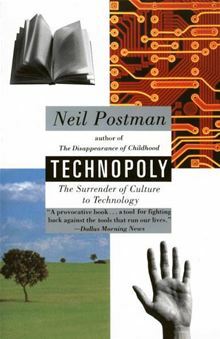 Technopoly: The Surrender of Culture to Technology Neil Postman (Penguin) $14.00 You most likely know–and should own--Amusing Our Self To Death, and this is in some ways a companion volume. I love this book, a easily read overview of how submission to technique and the gods of efficiency have reduced us in many ways. He calls us to be “loving resistance fighters.” Is it to late to join the resistance? Read this book and be inspired to make new choices with a new vision. And, while your at it, his End of Education is a wonderful read, too. The Technological World Picture and the Ethics of Responsibility: Struggles in the Ethics of Technology Egbert Schuurman (Dordt College Press) $9.00 I really want to promote this very important author—an important neo-Calvinist and engineering professor in Holland. We have several of his other heavy books, including his magnum opus, Technology and the Future, recently re-issued. Highly recommended for those seeking a serious, somewhat philosophical survey from a viewpoint that resists either demonizing nor making an idol of the good, but always distorted, gifts of technology. 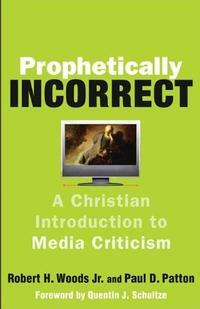 Prophetically Incorrect: A Christian Introduction to Media Criticism Robert Woods & Paul Patton (forward by Quentin Schultze) $19.99 You’ve got to look closely at the cover—the monitor screen has a picture of Jeremiah! 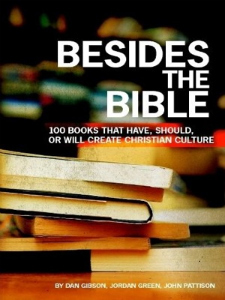 Yep, this includes some pretty serious prophetic imagination–with a rave review from Walter Brueggemann, it should! With close readings of pop icons like Lady Gaga and serious Biblical vision, this offers us important guidance in learning the art of cultural criticism, with no glib answers or simplistic reactions. Excellent! How to Read Slowly: Reading for Comprehension James W. Sire (Waterbrook) $13.99 Everywhere I go, and DBU was no exception, I’m asked about speed reading. I always suggest this slow antidote to the foolish idea—learning to read carefully and taking up the joys of truly appreciating “where the author is coming from” by an author who has very special gifts, seen in his classic worldview handbook, The Universe Next Door. This shows how to be discerning about what is “between the lines” and invites a deeper appreciation of all we read, fiction, non-fiction, poetry and more. Very nicely done, highly recommended. After this, go for his weighter books like The Discipleship of the Mind and Habits of the Mind: Intellectual Life as a Christian Calling. 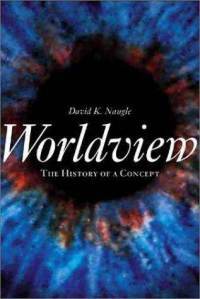 By the way, his reflection on his changing understanding of what we mean by worldview and why it is important, Naming the Elephant, Sire jokingly calls “Naugle for Dummies” as it was inspired by DBU prof David Naugle. How ’bout that? 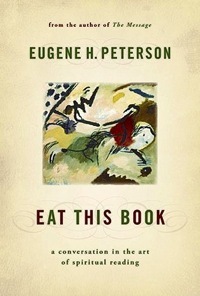 Eat This Book: A Conversation in the Art of Spiritual Reading Eugene Peterson (Eerdmans) $16.95 At an epic post at the end of last year when I was naming the best books of 2010 we celebrate the completion of Peterson’s profound five-volume set of spiritual theology. Interestingly, this second volume, on the practice of meditative reading lectio divina, seems to be the most popular. This is just a wonderful, wonderful, book, and we cannot recommend it enough. By the way–DBU Paideia students—the quotes I read in my first talk from Peterson about pastors and novels, and how his own ministry was transformed by reading about Leopold Bloom in James Joyce’s Ulysses, is from a chapter in Subversive Spirituality, a book of random essays, interviews, sermons and occasional pieces from Peterson. There are several chapters in there where he writes about books, novels and his love of the written word. d open-hearted reading. It is wonderfully writtten, really, but one must pay attention, taking in the serious prose. McEntrye is a fine poet with a keen artistic vision and here she writes with depth and elegance. At times passionate and heartfelt, she calls us to recapture a care for words, especially in our public conversations and civil discourse. Like other life-sustaining resources, we are called to exercise stewardship and care. In this handsome paperback McEntyre gives us twelve “stewardship strategies” ranging from “love words” to “don’t tolerate lies” to “stay in conversation” to “practice poetry” and “cherish silence.” She has a chapter on play and a chapter on prayer. And of course a chapter on reading well. What a lyrical, wonderful, wise and extraordinary book. Highly recommended. 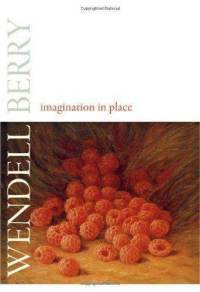 Imagination in Place Wendell Berry (Counterpoint) $14.95 At my DBU talks I mentioned in passing Berry’s Standing By Words (and recounted an episode from the novel Jayber Crowe.) This is a fantastic collection of essays united mostly around the theme of place—Berry discusses writers known for the keen sense of locality. For Berry fans, a few will be expected—Wallace Stegner, Gary Snyder, Donald Hall, poet Hayden Carruth. A few pieces are on large themes (“Against the Nihil of the Age” and “God, Science, and Imagination.”) God has given us this great ability to use our imaginations, to conjure and suppose. Berry’s own stories and social imaginary are stellar. His description of others he esteems are not only informed and helpful, but much needed. Now out in paperback, this is a great example of a rare kind of literary criticism. Literature and Theology Ralph C. Wood (Abingdon) $11.00 Don’t let the small size and inexpensive price of this paperback fool you–it is one of the best in the excellent “Horizons in Theology” series. Wood is renowned for a magnificent work on Flannery O’Connor and a very good book on Tolkien, amongst others. He’s a Texan, too, teaching both literature and theology at Baylor. 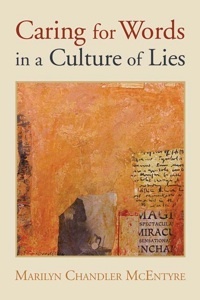 Here, he offers exceptional (and really fun) insights as he explores certain authors, even certain scenes in specific novels, highlighting the theological insight of, and power of, the stories. You’ll enjoy these very winsome analysis of O’Connor, Walker Percy, Tolkien, Eliot. The piece about doubt and God’s goodness in Lewis’ Til We Have Faces is excellent. And he has a chapter on the classic sci-fi book by Walter Miller, A Canticle for Leibowitz. The Sweetest and the Meanest: Poems Tom Kimmel (Point Clear Press) $15.00 One of the great parts of my trip to Dallas was hearing (and the privilege of hanging out and talking books with) three great Americana singer songer-writers in their own rite, playing under the name The New Agrarians. 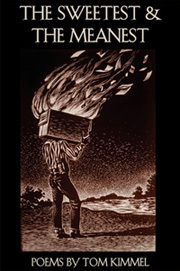 Tom Kimmel is highly regarded as guitar player, tunesmith and lyricist, and he also has a wonderfully fun poetry volume. He read from it on occasion throughout the show, in that very southern accent, reading conversations between relatives about life and times, race and religion, in the new south. This is fun, good stuff. almost like short stories. Some will make you smile (I guarantee it) and a few might make ya cry. Enjoy! The Yellow-Lighted Bookshop: A Memoir, A History Lewis Buzbee (Greywolf Press) $14.00 For those who just love books and bookstores, this is a beautifully crafted small work, spending much time on the history of the book industry—yes, truly starting in antiquity. Throughout, Buzbee tells of his own passion for books, his work in a bookstore, and his years as a publisher’s sales rep (calling on booksellers, promoting forthcoming authors and titles.) What lovely fun–history, business, and the celebration of the reading life. Mysteries of the Middle Ages And the Beginning of the Modern World Thomas Cahill (Anchor) $22.00 This large paperback is a treasure to behold, with full-color reproductions and a breezy style that makes this compelling reading even for those who don’t typically enjoy history. In my book lectures I noted How The Irish Saved Civilization, the story of Patrick going to Ireland and creating a historic writing, reading, and book-loving culture. This is another of Cahill’s fine “Hinges of History” series. I mention it here in part because I realize that I often (and passionately, for instance in my five part Rob Bell essays) blame monastic culture for helping to dig us into the ditch that suggests prayer is more important than more ordinary human activity or that missionary or priestly callings are higher than the vocations of commerce or farming or politics. That sacred-secular dualism stuff that blends neo-Platonism with gnosticism. I realize I have only told half of the story, and this wonderfully affirms the other part—the high middle ages were a time of beautiful art, incredible architecture, expanding knowledge (including great love for manuscripts and codices, the forerunner of books.) One reviewer called the book “intoxicating” and I suggest it now at least for how it illustrates the intellectual richness that foreshadowed the Renaissance. For a more studious, and highly regarded work on the monastic culture, specifically, see the intellectual tour de force by Jean Leclercq, The Love of Learning and the Desire for God (Fordham University Press.) I’ll also offer a fine shout-out to the latest John Piper, Think: The Life of the Mind and the Love of God which I really, really liked for many reasons. Thanks again for joining us for an excellent, engaging conference! We really enjoyed having you, fueling the fire of our bibliophilia and encouraging us to spark others through books.